Home 2010 2010 Facebook status 2010 Year-ender Facebook Facebook Addiction FB shoutout social networking site YearEnder My 2010 Facebook Statuses! 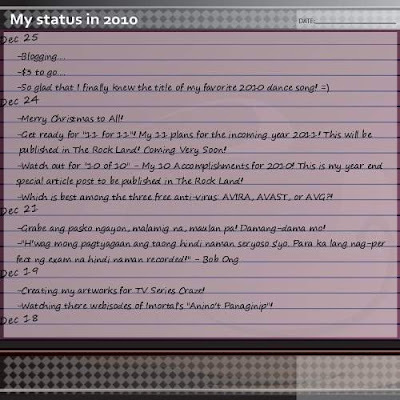 Here are the compilation of my 2010 Status in FB. Thanks that Facebook has an application that compiles all your posted statuses. Yup, that's all my statuses in the hit social networking site Facebook from March to December 25, 2010. These include my greetings for the holidays, my day to day moods, my feelings, my emotional conditions, my activities I'm doing and will do next, and other more interesting topics that really captured the attention of my FB friends! "Grabe Ang Pasko Ngayon, Malamig Na Maulan Pa! Damang-dama Mo..."
"H'wag mong pagtyagaan ang taong hind naman seryoso s'yo. Para ka lang nag-perfect ng exam na hindi naman recorded! - Bob Ong"
"Papayag Ka Bang Maging No. 2?" "Work Kanina, Party Afterwards, Blogging Ngayon, Date Naman Bukas! Hehe"
"Flirting and Blogging...ang hirap pagsabayin!" 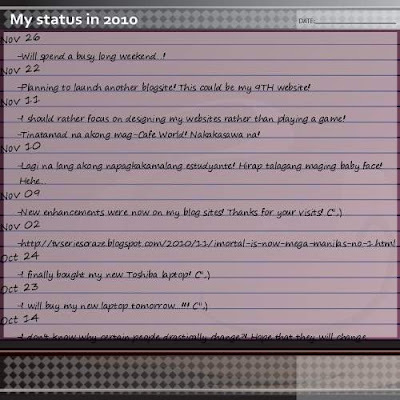 "Hindi ako makapagconcentrate sa blog...! Ang daming destructions, and daming tukso! Hahaha!" "Sana Magkita Kami Uli! Kaya lang Next Week Pa! =)"
"Lagi na lang akong napagkakamalang estudyante! Ang hirap talagang maging baby face!" "I don't know why certain people drastically change! Hope that they will change for good..and not for worst! In any ways, they will suffer the consequences!" "Nakapagtataka ang biglang pagbabago ng mga tao! Hayz!" wow..cool.. na compile mo talaga yan ahh.. astig! !